With Power BI’s imminent GA release we’re excited to announce a number of new capabilities to the service. Power BI groups offer a powerful collaborative experience built on Office 365 groups. Groups in Power BI bring you and your colleagues together to collaborate, communicate, and connect with a single view for all your data. You can either access your existing Office 365 groups from Power BI or create a new Group. Simply add your co-workers to this group and you can start building dashboards and reports that your entire team can consume. All this is part of the Power BI Pro license: there’s no need to have any other license! Almost every BI team have content they need to publish to the larger organization. Power BI makes creating dashboards and reports extremely simple, and now users can publish this content to the organizational content gallery. 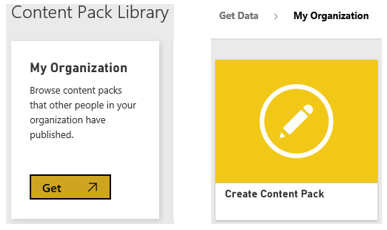 Organizational content packs are a great way to enable users in your organization to leverage the critical business data spanning on-premise and cloud data sources in a single location. 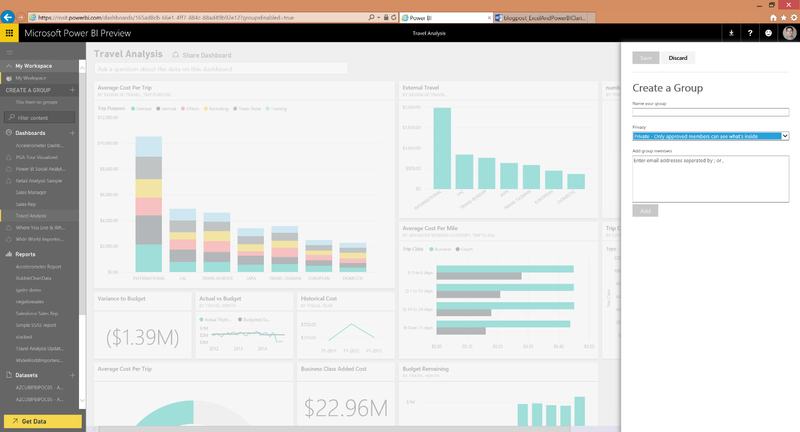 Since they’re part of Power BI, organizational content packs leverage all the great features of Power BI including interactive data exploration, new visualizations, Q&A, integration with other data sources, data refresh, and more. You can also package up and publish your own dashboards, reports, and datasets with coworkers in a specific group, or your entire organization. 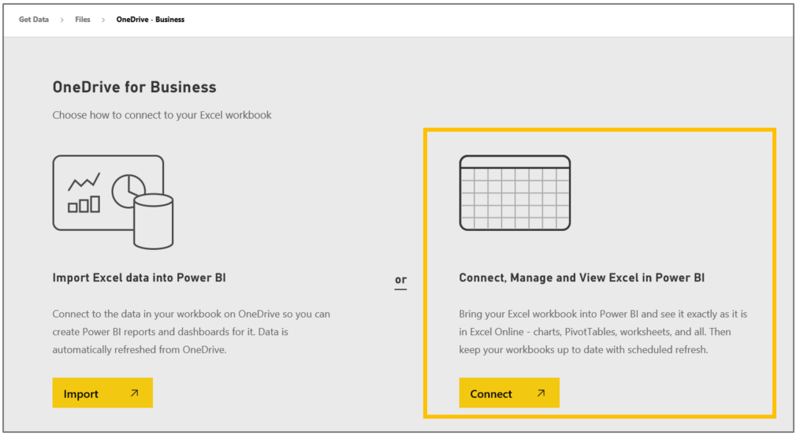 When you select Files from Get Data you need to choose “Connect, Manage, and View Excel in Power BI” to view your Excel workbooks exactly as they appear in Excel Online. Just like Excel or Power BI Desktop file, a comma-separated values text (CSV) file can also be a dataset for your Power BI dashboards and reports. You can upload a CSV file from your computer, or connect to them on OneDrive for Business or OneDrive Personal. 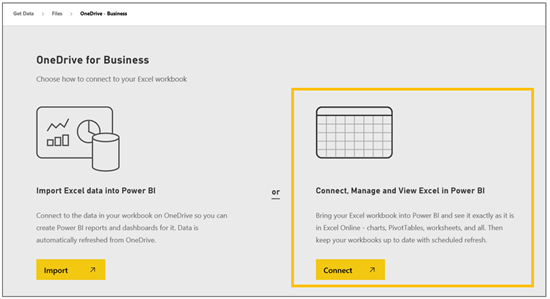 All of Power BI’s capabilities are available for datasets created from a CSV file: build interactive reports, ask questions using Q&A, and build dashboards from these visuals. Say you upload an Excel, Power BI Desktop, or CSV file from your computer to Power BI, and use it as a dataset for reports and dashboards in Power BI. Now say you change the version of the file on your computer. As long as the file name is the same, you can upload the updated version to Power BI and it will replace the existing dataset. All the reports and dashboards that are connected to this dataset now automatically use the new version. Power BI now supports role-based, row-level security and permission defined in on-premises Analysis Services tabular model. Share a dashboard that is connected to an on-premises AS tabular model, and your colleagues will see only the data they have access to.